I've been working on a new PW, I just wanted to post my pictures of my current progress to date. Here's the front, just the bare minimum, VFO knob, Unbal Line Input, PTT line and antenna relay on the terminal strips. There's no need for a voltage or current meter, it's a one time tune up with a watt meter. This is the inside, the bare copper clad board is where the single FET class-A shunt modulator and the Class-D final and output network will reside. The copper clad board towards the front right houses the VFO. This is the back, the small black HS on the left is for the two RF FETS, the sink in the middle is for the Modulator FET and the one farthest to the right is for the current sourceing resistors. I'll finish up with the wiring tomorrow, all the drilling and blasting is done except for the power cord, I don't have a strain-relief so I'll have to stop by Radio-Shack tomorrow, then I'll do some testing on the bench. Catch you on the air with 1.5 watts carrier! This is the driver stage connected and tested to the two final FETs mounted to the heatsink. Thanks Bob (N9NEO) for the binocular cores! This is the output filter and impedence matching network, it's a combination of series resonant, toroid transformer and L.
Here's the complete RF deck with temperature regulated VFO, being prepared for a trial run. If everything works out okay and I get some good on-air reports, I'll post some schematics of the circuitry for you guys. This is the rig completely wired and ready to go on the air. Today I worked a few stations with 1 watt, my vfo design is very temperature unstable I tried building a temperature regulator and it seemed to work well when the vfo was outside the rig but once inside the radio near the power transformers the frequency stability became very poor, I'll planning on doing a complete redesign of the VFO, but except for that the rig runs awesome! Thanks again to Bob N9NEO who helped me with parts and advice to build a nice 75M VFO for the PW. Looks like it's really coming along, OM! I haven't been on PW for a few weeks... lets try it soon at 1W both ways. ke1gf wrote: Well class-A shunt direct coupled is very inefficient so a lot of the power wasted as heat. From the modulator perhaps, and those transformers seem to be several amps at 13.6V! Neat project IAN, how are those TTL level FETs? The ones that I looked at were pretty slow. ke1gf wrote: Neat project IAN, how are those TTL level FETs? The ones that I looked at were pretty slow. All I can say is that theyre fast enough for 160! I have used an MTP3055EL (VL?) 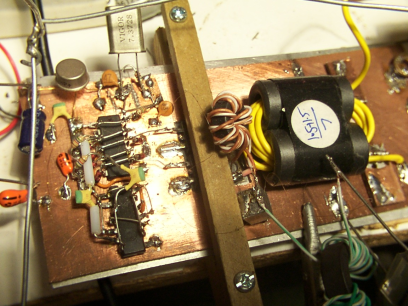 logic level fet in a straight class C amp on 40 M at arount 10W and that seemed OK. The specs show them as having less sharp turn on charateristics, but you can fully turn them on with parralleled HC series CMOS gates at 1.8Mhz which makes for real cheap and easy drive. Well guys, I finally finished my PW project and put together a page with all the whole picture and some schematics.